Read this blog to know why it’s time to include ICICI Pru Technology Fund to your portfolio. Continuous increasing rates in the US, a lower rate of unemployment, and the planning to reduce the corporate tax by President Trump are all reasons responsible for bringing growth opportunities in the Information Technology sector of India. Talking of technology sector, it’s close to impossible to miss the name of ICICI Prudential Technology Fund. As the name clearly states, it is a technology-oriented mutual fund offered by ICICI Prudential Mutual Fund. Moreover, it invests in the sectors which are linked to technology like ITES (Information Technology Enabled Services). Today, in this write-up, you will learn about the benefits of investing in this technology fund. Also, you will be able to check the complete details about the same. This fund is an open-ended equity scheme which is suitable for well informed & active investors who are looking for good investment opportunities for the long-term horizon. Experts believe that especially if the broader market is over-valued, this sector can provide you with good value buys. It does not charge any entry fee and allows investors to start with as little an amount as Rs. 500. Where Does ICICI Prudential Technology Fund Invest your money? ICICI Prudential Technology Fund is a multi-cap technology fund which invests your money in large technology-oriented companies, particularly the ones listed in the BSE Teck. The fund manager has made almost 8% exposure to small & mid-cap companies in the portfolio as he is expecting good value buying to enhance the return from the small & mid-cap. The fund seeks to stow money in knowledge sectors such as IT and IT Enabled Services, Media, Telecommunications, and similar others. India’s competitiveness in offering cost-effective IT services which are nearly 3-5 times less than that of the US continues to be the mainstay USP of the nation in global sourcing market. Other factors include the increasing size of the internet industry which is expected to be approx double by 2020; this will directly provide an upsurge of 7.5 percent to the GDP. According to NASSCOM, due to fast adoption of digital technology, the number of Indian internet users is expected to reach 730 million by the end of 2020. Digital payments are expected to grow by 32% in 2017-2018 in terms of transaction’s volume. Besides, several government initiatives like setting up Wi-Fi services in 5.9 lakh villages by 2019 are providing a strong back to this segment. Emerging technologies can also offer an entire new gamut of opportunities for the top IT firms in India. It is clear that the core competencies and strengths of this sector have attracted various investments from major countries. Henceforth, the sector can provide lucrative growth and investment opportunities to the investors. The primary objective of the investments made through this scheme of ICICI Prudential MF is to proffer considerably good returns in the long run through major investments in the IT sector and other sectors related to technology. It is suitable for investors who want to take a call in value base investing in high valuation market; particularly the ones who can also take moderate to high risk but are willing to seek high returns in the upcoming years. However, the investors who are either looking to fulfil lifestyle needs or any short-term goal should opt for some other relevant scheme. 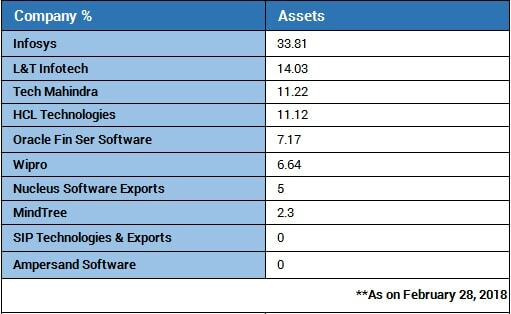 A large share of the assets under its watch is invested in software and related stocks. The fund also opportunistically invests in companies outside the companies listed on S&P BSE Information Technology index, but which form a part of information technology services industry. Stock selection is done with the primary objective of attractive valuation and long-term return potential rather than currency view. Portfolio liquidity is also given due consideration. Going through its performance, you can see that the fund has performed excellently in the last one year. Moreover, statistics also depict that it was successful in outperforming its benchmark in almost all the years. While analyzing the chart, you can see that the fund’s performance in the long-term horizons, say 5 to 10 years, is commendable beating its benchmark as well as the category as a whole. Thus, keeping its risk measures and long-term returns into perspective, it can be an ideal choice for investors who are looking for long-term investment opportunities in this segment. Mrinal Singh is managing ICICI Prudential Technology Fund. He holds more than 14 years of experience in this field and has been handling this fund from Aug 2009. It has been able to perform spectacularly well in the last 5-year period. As a fund manager, his investment philosophy is to seek value-orientation at the core. Thus, he digs deep to operate his portfolio in this frothy market. He started off by building a strong position in the tech space at Wipro Ltd. and Bosch India; thus he always finds the sector regarding risk-reward. Considering his educational background, he has completed his B.E in Mechanics and PGDM in Finance. Due to the expensive valuation in other sectors of the market, there’s a sudden rise in the technology sector. Considering the scenario a few months back, the market was touching its all-time highs and making new records. There is stretching in the valuation of the market capitalization; thus the fund managers prefer to buy IT sector stocks in the dip. There are several other factors (Read: Is it the Right Time to Invest in IT Sector) responsible for the same. The point is that the time has come when this segment will experience a boost for at least one year now. Thus, the investors who have moderate to high risk profile can plan to invest in this scheme. However, the investment should be made for long-term. It’s time to go shopping for some good value buys, and ICICI Prudential Technology Fund can be your ideal pick. In case you have made your mind to stow your money in this well-deserving fund, you can make use of our portal for the same. Further, if you have any query regarding the scheme, then connect with the experts at MySIPonline and find a sure-shot solution to it.